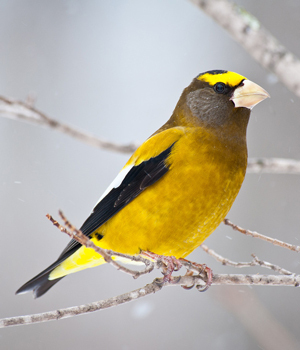 The Wisconsin Society for Ornithology Awards Program recognizes individuals or organizations that have made outstanding achievements in advancing bird conservation, promoting the field of ornithology, and contributing to the Society. The first WSO award recipient was Herbert L. Stoddard in 1940. The WSO Board of Directors selects recipients based on nominations received during an open nomination period. With the exception of the Hospitality Award, all award recipients are formally recognized during the Awards Presentation and Reception held at each WSO Annual Convention. We encourage members to recognize contributions of their peers by participating in the nomination process. For further information about individual awards or the awards process, contact our Awards Chair at awards@wsobirds.org. Hospitality – recognizes home and business owners that are gracious hosts and stewards of rare bird species. Noel J. Cutright Conservation Award - recognizes outstanding contributions to bird conservation in Wisconsin. Bronze Passenger Pigeon - presented to individuals who have made outstanding contributions in their local communities or in the state to promote the field of ornithology. Silver Passenger Pigeon – presented to members of WSO for distinguished service to the Society. Certificate of Appreciation - given to previous recipients of the Silver Passenger Pigeon who continue to provide exceptional service to the WSO. Golden Passenger Pigeon – presented to individuals who have made outstanding contributions to the field of ornithology. Samuel D. Robbins Lifetime Achievement – honors people who actively contribute to the Wisconsin Society for Ornithology above and beyond their having previously received the Silver Passenger Pigeon Award. Special Recognition Award – recognizes the collective efforts of a far-reaching project or partnership that increases the public's awareness and appreciation for birds, their habitats or the need for conservation. WSO is actively seeking suggestions for award recipients. You can send an e-mail to awards@wsobirds.org to make a suggestion. The Bronze Passenger Pigeon award was initiated in 1994. This award is presented to individuals who have made outstanding contributions in their local communities or in the state to promote the field of ornithology. The contributions may be through teaching (all levels); through conservation work (protection, preservation, restoration of habitat, etc. ); or through organizational efforts (forming bird clubs or other groups which further ornithology). The Silver Passenger Pigeon award was initiated in 1964. Presented to members of the WSO for "Distinguished Service" to the Society. The Certificate of Appreciation was initiated in 1981. It is presented to recipients of the Silver Passenger Pigeon award who continue to provide exceptional service to the WSO. Initiated in 1939 as "Honorary Life," this award for outstanding achievement in the science of ornithology was renamed the "Golden Passenger Pigeon" in 1978. It is awarded for recognized published research, major book efforts or other such work in ornithology. It conveys life WSO membership upon the recipient and is limited to 15 living members at any time. The Samuel D. Robbins Lifetime Achievement award was initiated in 2000. It honors those people who actively contribute to the Wisconsin Society for Ornithology above and beyond their having previously received the Silver Passenger Pigeon Award (for service to WSO) and the WSO Certificate of Appreciation (for continued service to WSO). The Special Recognition award was initiated in 2014. It was created to recognize the collective efforts of a far-reaching project or partnership that increases the public's awareness and appreciation for birds, their habitats or the need for conservation.